The new post-election parliament has a unique spectrum of parties. Unlike its monolithic predecessor, diversity has reared its head in the form of two ‘new’ parties. The first is the 38 year old Nationalist Movement Party (MHP). The second is the Democratic Society Party (DTP), which won its seats by fielding its candidates as independents. The former is the party of Turkish nationalists while the latter is the party of Kurdish nationalists. The MHP’s history dates back to what are claimed to be racist and fascist origins that have been put aside by evolution into a more traditional rightist party. The DTP’s history is marked by illegal organizations, third-world dreams of independence, and Stalinist guerilla actions. Today, both of these parties represent the very extremes of the political spectrum. Both parties survive on the ethnic problem. The DTP represents the radical tendencies of Turkey’s Kurdish population, with most ethnically Kurdish nationalist movements believed linked to the party. The MHP represents the growing stream of Turkish nationalism that has arisen in response to the Kurdish terrorism of the Kurdistan Workers Party (PKK). 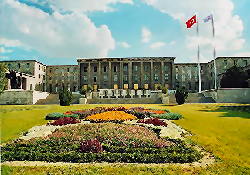 Serious concerns surfaced when the election results were announced and there were claims that the new parliament would descend into destructive disputes between members of the two parties. In fact, the contrary occurred on the opening day the session: the DTP’s leader Ahmet Türk and his colleagues walked towards the MHP seats and respectfully extended their hands to MHP’s leader Devlet Bahçeli. The MHP leader then also extended his hand and both leaders stood there shaking hands. The following day pictures of the two leaders shaking hands were all over the news. Turkey has a chronic ethnic problem, which is actually the Kurdish problem. This problem is the very reason for the MHP’s and DTP’s existence. We can interpret how this problem will progress by looking at the actions of these two parties: actions like the shocking hand shake. These two parties are now expected to represent tendencies and policies that are vastly different from the stereotypes. Turkey has a rich ethnic tapestry. The Turkish Republic, the heir to an outstanding empire, hosts many ethnic groups and faiths. Most of the larger ethnic groups are communities that immigrated to Anatolia and they have been open to integration. The Kurds are different, they are indigenous and now comprise between ten and fifteen million of the state’s seventy million population. The Kurds have managed to preserve their language and traditions and it is very natural for different political tendencies to have manifested themselves in the Kurdish population as they have expanded into Iraq, Iran and some parts of Syria. These tendencies have come from all parts of the political spectrum including the pro-independence set which calls for a United Kurdistan, and those who favor a great Turkish-Kurdish federation. Yet others want to fully integrate in Turkish society. The main Kurdish population center is in Turkey’s southeast, but social mobility and internal emigration now means that more than half of the Kurdish population lives outside of that region. The living conditions in this region are difficult at least partially because of the extremely arid climate and the underdeveloped economy. The Kurds are constantly moving to western Anatolia, making it impossible for them to constitute a geographic entity. In fact the ideal of an “Independent Kurdistan” is a merely fairy tale to most Kurds because the Kurdish population in the west will lose all ties with their homeland in the southeast within two generations. There are allegations that the DTP is the political arm of the outlawed terror organization, the PKK. But the DTP actually represents the extinction of violent methods and they persistently state that violence is not the solution and that they merely want to defend their rights through the democratic process and therefore support peace and dialogue. The high number of votes that the Justice and Development Party (AK party) attracted in the Kurdish regions decreased the DTP’s representation. The DTP, however, still represents one third of the Kurdish population. The MHP exists as a result of the disturbances of the Kurdish problem, and the majority of its supporters perceive the Kurdish problem as a terror problem because of the flow funerals for martyrs that take place in western Anatolia of those lost in the southeast. The fear of separatism invoked by the Kurdish problem has fermented into paranoia for most of them. As for the DTP, this problem is what brought in the vote for the MHP. The MHP is the traditional party of doctrinaire Turkish nationalism: MHP members were caught in the center of the deep right-left polarization of the 1970s and were arrested and punished after the 1980 coup. The advent of Kurdish separatist terrorism in 1984 accelerated the rise of the MHP, and in 1999 the MHP won its highest percentage of the vote, surprising even the founders of the party. The party, which represents nationalist reaction, lost many votes as a consequence of its part in three-party coalition government between 1999 and 2002. The 2002 elections then saw the MHP fail to pass the electoral threshold. Today, most analysts agree that the MHP made its way back into Parliament because of the Kurdish problem. Nevertheless, the MHP itself clearly believes that it is a party centered on the Kurdish problem as it fails to say much, if anything, about other critical issues. The MHP leader’s statement following the hand shake hinted at a more constructive and careful approach to resolving this fragile problem in the new session. Unfortunately, there are obstacles before this constructive stance. First off, the “classically nationalist” group has a component that is against “compromise, tolerance and dialogue.” This component contains deposits of Hamas-like rhetoric, which see the world as black and white and appeals to the emotions rather than the mind. Note what Bahceli said during his party’s group meeting, his speech included words such as “seize, blood, blockade, trap, treachery, and destructive and separatist intentions,” we can see that it is hard to conduct politics with such warlike expressions, even though we’ve grown accustomed to such from military memorandums, and that there are serious difficulties in employing dialogue and tolerance in such a political atmosphere. Secondly, the ideological leaders and principles Bahçeli refers to are open to interpretation and debate. The MHP needs to reevaluate these ideologies and principles and generate new ideas. Bahçeli referred to Oct. 29 1923 when explaining the basic rules of living under the roof of a united Turkish Republic and coexisting in a Turkish national identity. But the date is wrong, most of the sensitive concepts and descriptions we debate today date back to after 1923. Are we going to describe Turkishness according to the more enclosed description in the 1924 Constitution or, the more limiting description in the 1982 Constitution? Also Bahçeli needs to elaborate on what he means by “one state, one nation, one flag, one language,” which he listed as the principles of “national unity and solidarity.” How will we place the Kurds, whom it is believed to come from a different ethnic root, within this “one nation” conception? Again, will MHP be able to practice their “one language” ideal without violating the right to learn in and use your native language for communication? The weeks following the elections are like a honeymoon. New parties wait for their votes to settle before they enter into polarization. This Parliament has two parties that owe their existence to the Kurdish problem, and so far, the signals from the deputies and parties have been positive. However, there is still a long road ahead of both parties. Considering the geographic distribution of its vote, the AK Party is the only party that represents Turkey above its ethnic differences. This makes the AK Party’s identity and policies the new focus in the resolution of the Kurdish problem. This involves a three-way interaction, with the DTP’s thesis, the MHP’s anti-thesis, and the AK Party’s synthesis. It seems that the leftist Republican Peoples Party (CHP) will remain outside the action. Removing the problem from a two sided polarization, will increase solution alternatives. Democratic solutions are gaining weight as violent methods are losing power and all sides are supporting permanent peace and tranquility. Ahmet Türk highlighted that those who voted for them are seeking a solution in Ankara. As long as it poses no threat to the unity of Turkey, the MHP is also mentioning “dialogue, tolerance and compromise.” As for the AK party, it is in power and representing the crushing majority , stability and security. A new synthesis is being born in the Kurdish and Turkish nationalist relationship.